May 11, 2018 - The leading ICO advisory firm TokenMarket is excited to reveal that it will be attending a number of high profile blockchain and crypto conferences hosted in New York during Blockchain Week NYC 2018. TokenMarket will be represented by a number of its team members at these industry leading events, including CEO Ransu Salovaara and CTO Mikko Ohtamaa. TokenMarket will begin its series of event appearances at the Crypto Economy Event in New York on May 13th, 2018. This event will kick off its third leg of the tour with Michael Terpin delivering a keynote presentation on ‘Investing in the Crypto Economy’. In partnership with Crypto Economy, TokenMarket are hosting networking and drinks reception on May 13th in New York after the programs informative schedule. Crypto Economy’s organisers, BECON have successfully organised numerous networking receptions producing a high turnout of guests, investors and industry through leaders. Following on from BECON’s Crypto Economy event, TokenMarket will be heading to Coindesk’s Consensus 2018 from May 14th-16th. After the initial success of the first Coindesk Consensus in 2015, the event has grown on an unprecedented scale, doubling the amount of speakers, attendees and sessions that take place each year. Consensus 2018 will feature over 250 speakers, 137 sessions and more than 4,000 attendees to discuss a number of areas within the blockchain industry. Leaders from a number of industries including investors, financial institutions and enterprise tech leaders will be attending to discuss the business of blockchain. 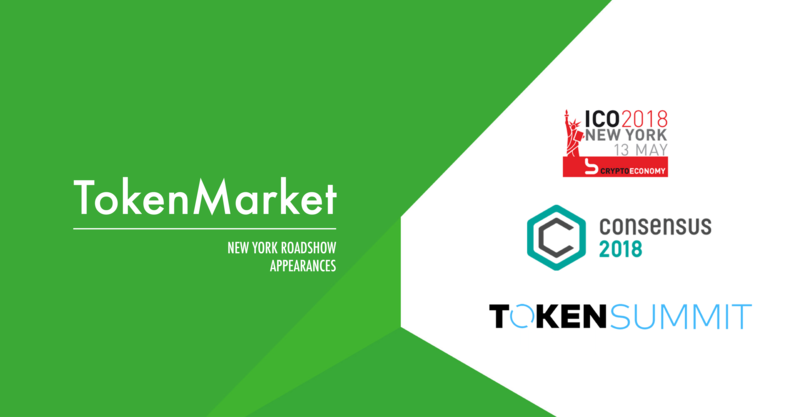 TokenMarket is excited to be attending Consensus after hearing exceptional feedback from its previous events and the team attending, are looking forward to meeting everyone at the conference. The final leg of the TokenMarket appearances in New York will conclude at the Token Summit III from May 16th-17th. The basis of the Token Summit III conference is simple: “to discuss the economics, regulation and best practices around blockchain-based tokens, protocols, and crypto-assets” as producers and hosts William Mougayar and Nick Tomaino state. With over 40 confirmed speakers across two days, TokenMarket is excited to explore the token based economy industry with some of the leading speakers in the industry. Please contact marketing@tokenmarket.net if you would like to connect with the team whilst in New York. TokenMarket is a premier ICO information portal and advisory firm. It combines its market experience, resources and data assets to create a professionally tailored solution to execute ICO’s safely and securely, providing an end-to-end service for token creation, presale and public sale. TokenMarket’s ICO advisory service has partnered over 30 token sales including Storj, Populous, Monaco, Civic and Dent, raising over $300 million in total.